in Compost News, Education, News At A Glance and tagged compost, tea. Bookmark the permalink. Every organic gardener knows their next crop is only as good as the ground it grows in. Keeping the soil healthy is of utmost importance for setting up a biologically sound system that can produce top quality produce for you to enjoy. 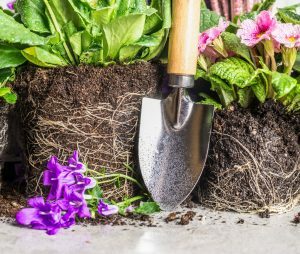 For this reason, avid gardeners treat their compost piles like gold, well aware that a generous heaping into their garden beds can turn low grade dirt into vibrant, healthy plants. Yet, boring black compost isn’t the only way you can get these soil benefiting nutrients in your garden. It turns out that straining and soaking small pieces of compost in water can actually create a biologically rich mix that is a boon to your blooms. Called compost tea, this simple infusion has taken the gardening world by a storm and it’s an easy way to cast off disease and improve nutrition for your plants. Best of all, it’s almost as easy to make as it is to use. To put it simply, compost tea is a liquid fertilizer and a plant disease suppressor full of biologically active compounds. The tea is made through soaking small amounts of finished compost in water and adding a food source (like brown sugar or molasses) to feed the hungry microorganisms within the soil. The process of aerating the water gives the present microbes all the tools they need to reproduce, so once the mix is done brewing you are left with a nutritionally rich, well-balanced supplement with incredible value as an organic liquid fertilizer. Best of all, compost tea is simple to make right at home from your very own compost pile (or from store bought organic compost if you use that instead). The two requirements are that the compost must be organic and it must be broken down into tiny particles. Think loose leaf tea leaves for a good sense of size. It might seem like a lot of unnecessary trouble to brew, strain and spray a compost tea when you could otherwise simply work compost into the soil. However, there are plenty of benefits that you get with compost tea that regular compost simply can’t match. Not only does compost tea help suppress foliage diseases, it also improves the amount of nutrients that plants can access and even improves the flavor of vegetables. If you’re looking for a way to get more bang out of your soil amendments, compost tea is the way to go. There’s a lot to like about incorporating compost tea in your garden. Some of the top benefits are listed below. Better plant growth in the form of better tasting vegetables, bigger blossoms and greener leaves. A boost of beneficial organisms that enhance the immune system of plants. Plenty of nutrients for the plants that are easily absorbed straight through the plant roots. Encourages the growth of root systems to help your plant pull nutrients from farther down. Provides an all-natural alternative to harsh chemical composts that cause harm to native plants, insects, wildlife, and even humans. When you look at the facts, it’s easy to understand why compost tea provides such big benefits for your garden. Soil is teeming with microorganisms, some that help your plants grow and others that bring disease and suppress growth. It’s much harder to have a healthy garden if you don’t have an imbalance between the beneficial microbes and the pathogens that dwell with them. Compost tea simply boosts the ratio of beneficial microbes, and because they become well oxygenated in the process, they add oxygen back into the soil, meaning they can out-compete the naturally anaerobic bad bacteria. Just like humans that need to fill their diets with fermented foods to keep their probiotic levels high, plants also require lots of healthy microbes to help them thrive. As opposed to regular pesticides that kill off the good and bad bacteria alike, compost tea helps you boost the populations of the kind you want in order to create a healthier, more robust soil structure. If you’re ready to experience the benefits of compost tea by making some yourself, these instructions will help get you started. If you want more nuanced information about the best ways to make your tea, the book Compost Tea by Mark Remillard is a smart place to start.